Have you ever wanted to see a $450 USD melon? Or maybe munch on a red bean filled fish waffle? What about eating grilled meats on sticks under train tracks? You can experience all this and more on the All Star Tour of Tokyo with Arigato Japan Food Tours. One of my favourite things to do in a foreign country is to seek out a local food tour. While I do my own research when it comes to foods to try and places to eat at, there’s nothing better than getting shown these things by a local. Especially in Japan, where customs and food etiquette are so important. 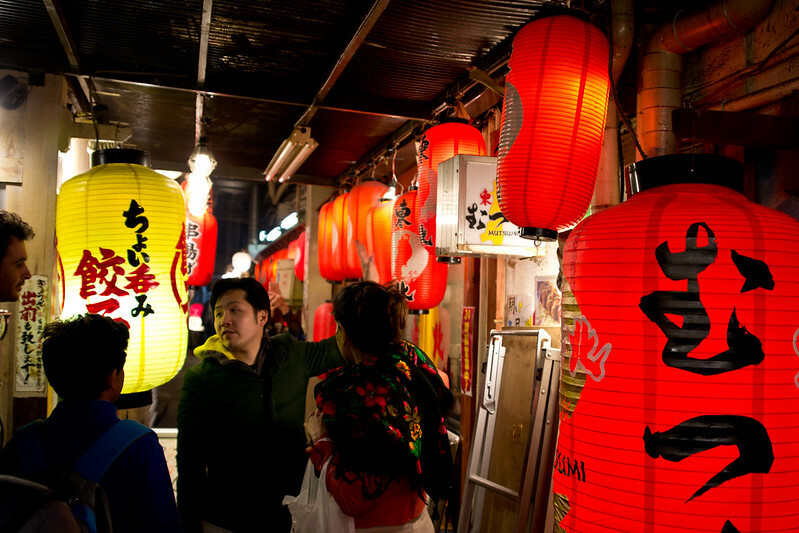 This is where Arigato Japan Food Tours come into play. 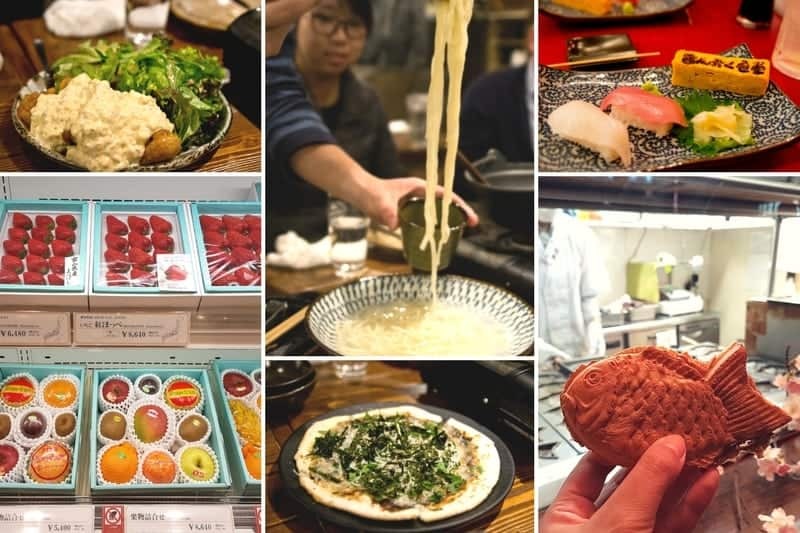 While in Tokyo, I had the opportunity to experience two of their food tours: the All Star tour which takes you through Yurakucho, Ginza, and Shimbashi and the Shibuya tour which takes you through the streets of this popular neighbourhood. Both were filled with tasty foods and I learned a lot about food culture in Japan from them. Originally what drew me to Arigato Japan Food Tours were the unique options on the All Star tour which takes you to an area that the typical tourist may not explore on their own. 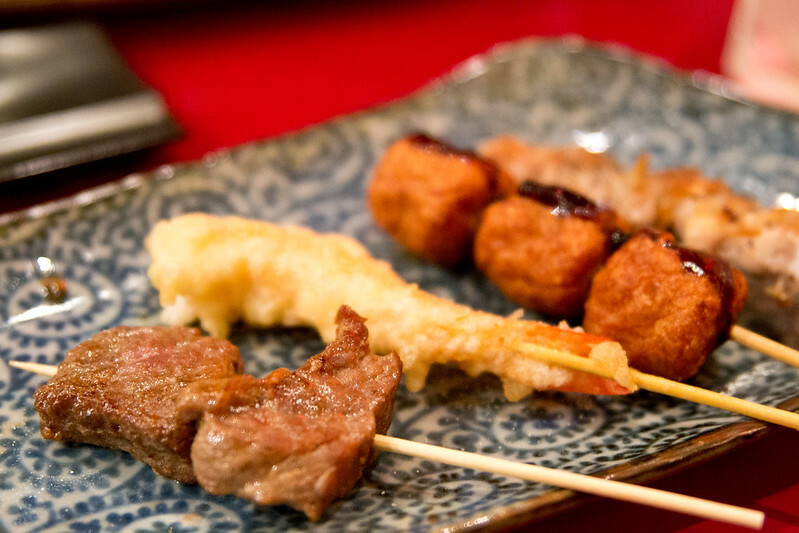 You visit four different stops to try foods from all across Japan. It felt very much like a progressive dinner with each stop being an appetizer, a snack, main course and then dessert. First up was an izakaya underneath the train tracks where I dug into a variety of grilled meat on sticks, a couple pieces of nigiri sushi and tamagoyaki (Japanese egg). The plate of yakitori came out first which was really satisfying and then they came out with the sushi. I was pleasantly surprised at how much food there was. Next, we stopped off for a snack at a grocery store that specializes in fish cakes called satsuma-age from the Kagoshima prefecture. Our third stop was our main food stop where we tried so many dishes! They just kept on coming and I hadn’t tried many of these before either which was nice. 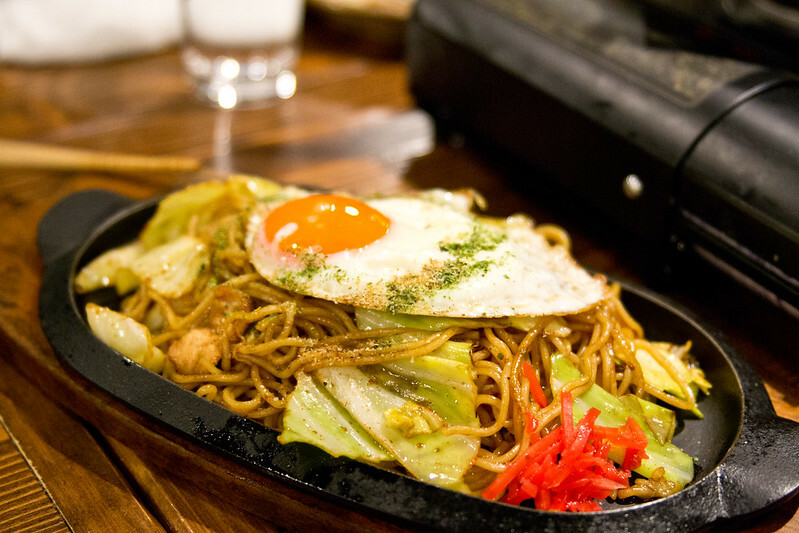 Just look at that egg on top of this yakisoba! Some of them were modern interpretations of Japanese dishes that I had tried previously. From amberjack sashimi (yum!) to white fish pizza (interesting), to udon and yakisoba, everything was really tasty. I thought these were meatballs at first, but nope! They’re meat wrapped rice balls with a soy glaze. So good! The restaurant we went to was on the 7th floor of the building. Coming from North America, it’s so easy to forget to look up as well when wandering around Tokyo. There are so many more food options and things to look at if you look up. The final stop of the tour was for one of my favourite snacks: taiyaki. 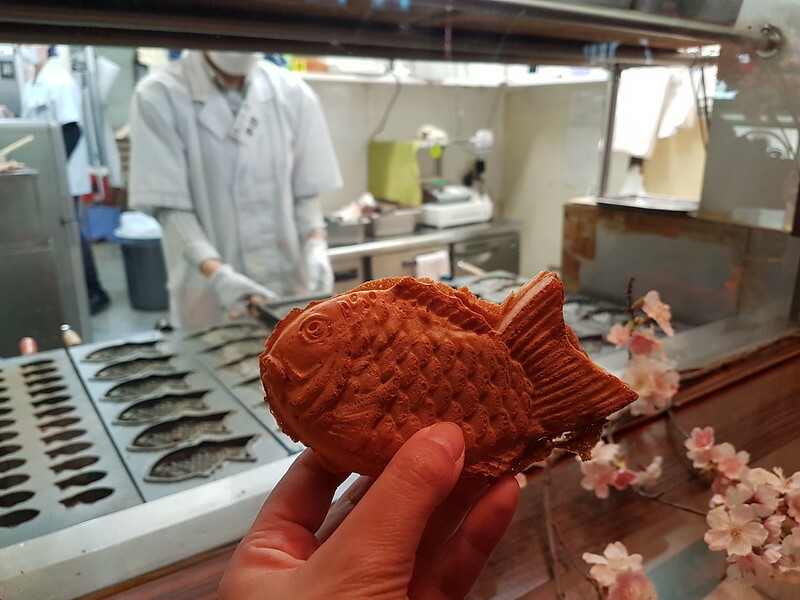 A fish shaped waffle filled with red bean. You have the option of getting it with other fillings but red bean is the classic. By this time I was so stuffed, but it came it a handy pouch that I took home with me. Along the way, we stopped to check out a store that sold expensive fruits. I had heard lots about this phenomenon but had never seen it in real life. I really can’t wrap my head around buying a melon for so much money! Our tour guide explained that these fruits are like a status symbol and commonly used for gifts. You’re paying for perfection in the fruit and for the special moment that the fruit represents. If I weren’t on this tour, I definitely would have just walked right past this shop without knowing what was inside! My favourite fruit! But I don’t think I’d pay that much for one! 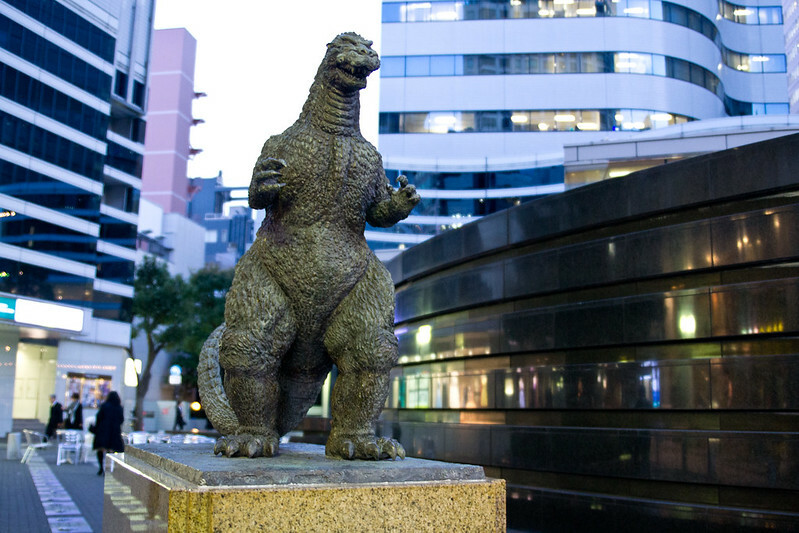 We also saw the Godzilla statue which was surprisingly small. You’d think Godzilla would be huge, but nope! 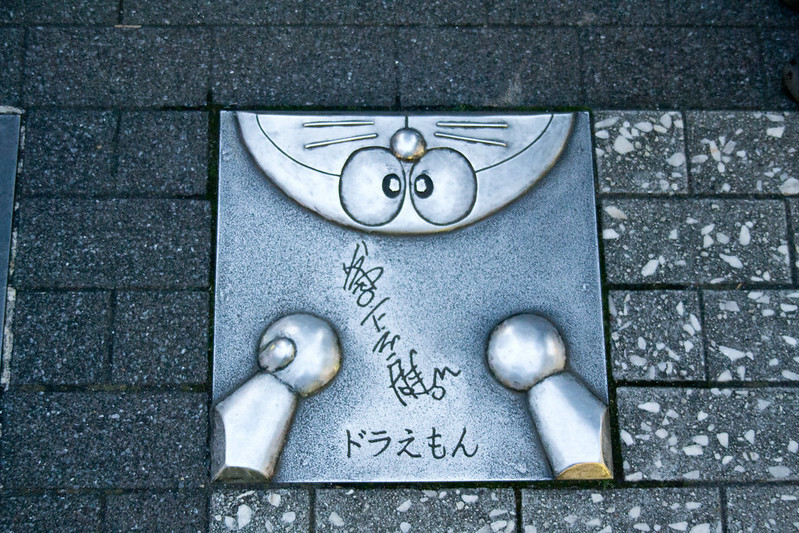 Walked through Tokyo’s equivalent of Hollywood’s Walk of Fame, where I spotted a plaque for Doraemon! How cute! Should you go on the All Star tour? Most definitely yes! I had an enjoyable time on my tour. The tour guides were really personable and friendly, striking up conversation with everyone and encouraging everyone to mingle and talk to one another. As a solo traveler, this was an awesome way to meet people (and hello to anyone in my tour group reading this now!). 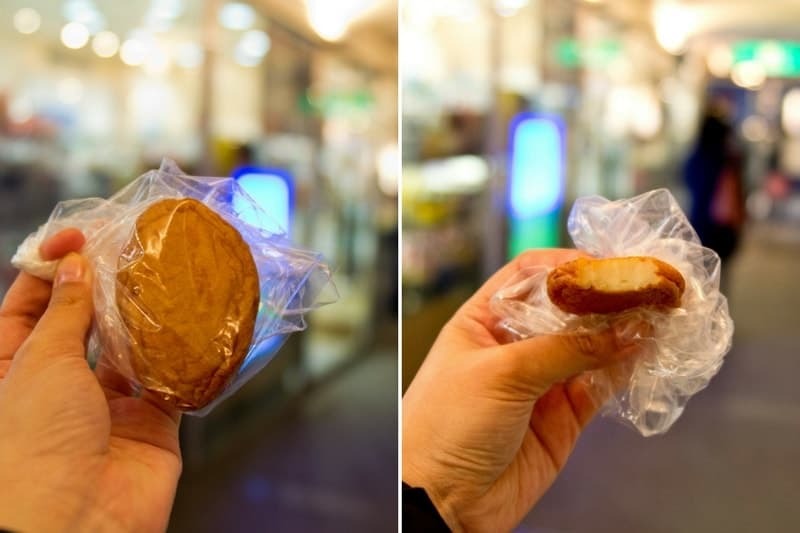 I would suggest going on the tour at the beginning of your trip so you can pick up some of the subtle bits of food etiquette (and there are a lot of them!) to use during the rest of your time in Japan. But what about allergies or special diets? The guides ask at the very beginning of the tour if there is anyone with restrictions on what they can eat or if there are any allergies in the group. We had a couple people on the tour that didn’t eat pork, and they received substitute items at a few of our stops. 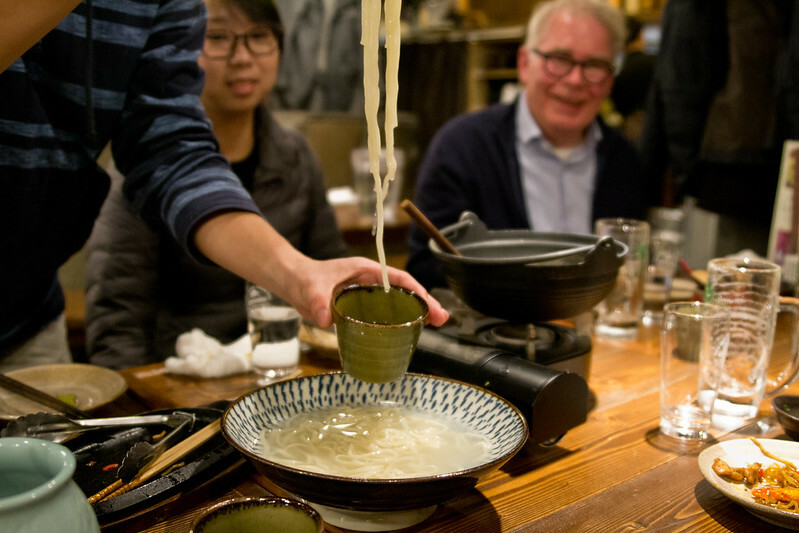 What makes Arigato Japan Food Tours stand apart from others is their commitment to small groups of no more than 8 people. This intimate group size really allows you to get the most out of the experience and you can ask all the questions you want of your tour guide. You cover a lot of ground on this tour, but after a month of walking in Asia, it really didn’t feel like too much walking for me. There is a lot of stopping and talking along the way so you really don’t realize how much you end up moving. Another thing to consider is the cost. 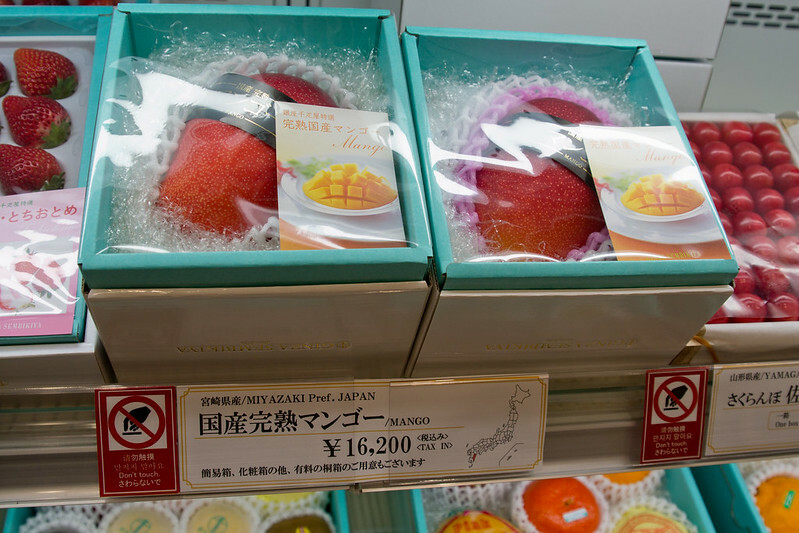 At $125 USD per person, the All Star tour may not fit into all budgets, but if this is your first time in Japan, trying to navigate through the language and unspoken rules of dining can be confusing overwhelming. This tour gives you the opportunity to learn proper etiquette and remove some barriers for dining out on the rest of your trip. Also be sure to follow them on Twitter and read their blog. They provide a ton of insight on Japanese food on both. If you can’t fit this tour into your schedule, consider the Shibuya tour which I also experienced (review coming soon!). 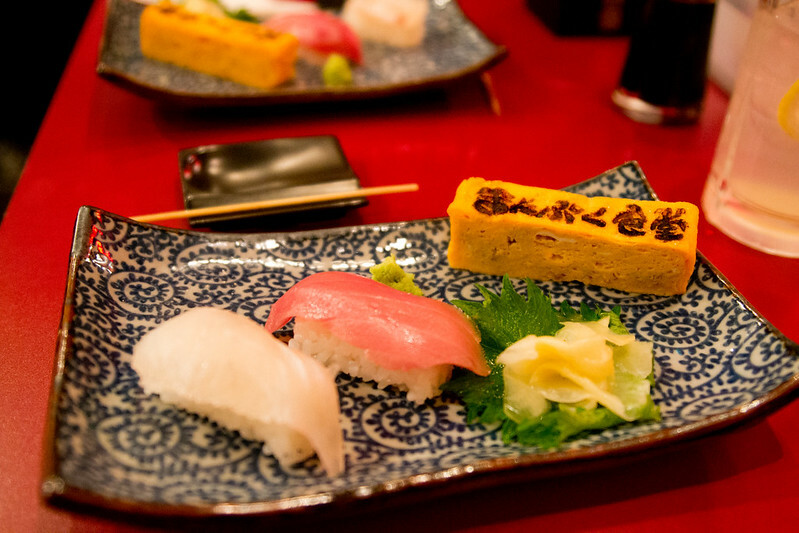 Beyond just these two tours, they have so many other food tours in Tokyo, Kyoto and Osaka to select from. If you’re interested in going on a couple tours, they have combos and seasonal specials that will save you money. 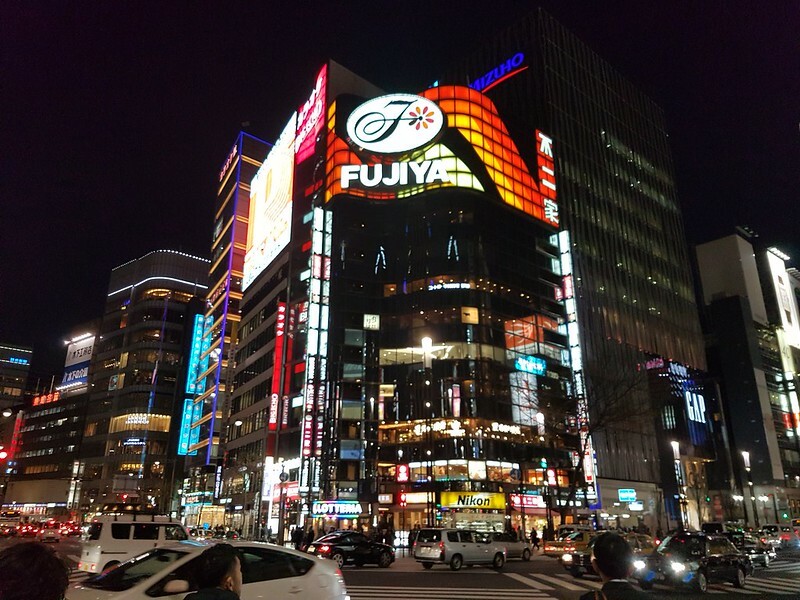 The All Star tour from Arigato Japan Food Tours gives you really good value for your money. The three-hour adventure through the winding streets of Tokyo is full of trivia, jokes and lots of good food. The guides explain every dish and if there are any specific tricks to eating it. Throughout the tour, they’re also really friendly and answer any and every question you may have, even if it has nothing to do with food. You get to try a variety of foods, especially at the third stop and you leave the tour feeling completely stuffed which is always a good thing on a food tour! Disclosure: I was a guest of Arigato Japan Food Tours on the All Star tour. As always, all opinions and observations are my own. looks brilliant! Now I’m hungry damn it! So glad that you had a great tour! 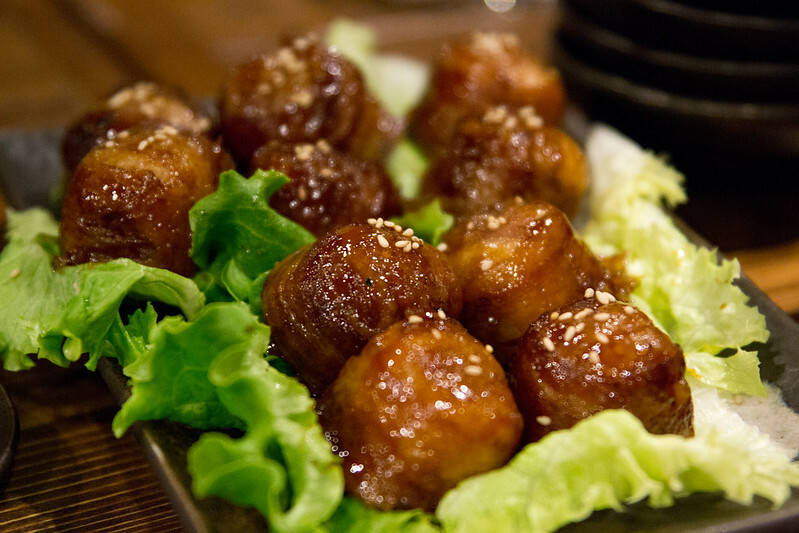 Arigato Japan Food Tours sounds awesome! I’m with you – I enjoy hitting up food tours when I visit a new country, because they tend to take you off the tourist path and you get to experience really authentic, local food, like you guys did here. LOVE Japanese food, and can’t wait to get back to Tokyo soon! I love doing food tours, too, and think they’re a great way to learn about the local culture. The stories are as good as the food! 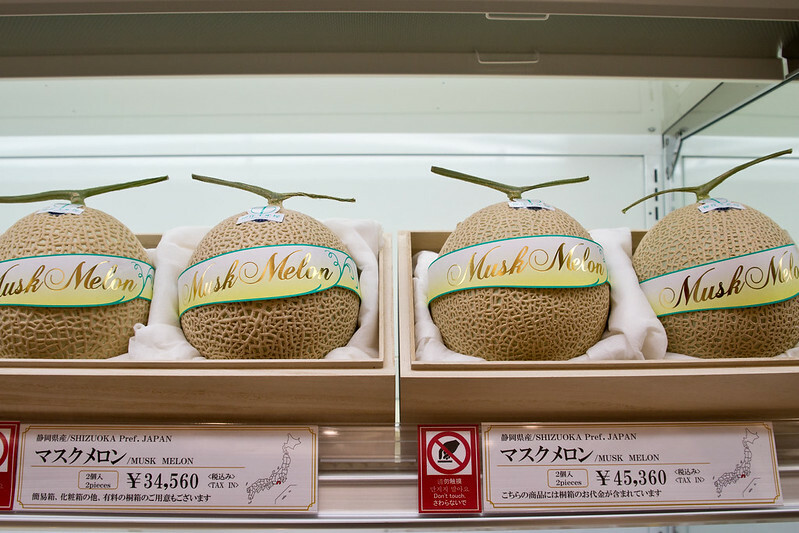 I can’t believe those melons are hundreds of dollars. Wow! I love Tokyo so much and especially its food traditions. I was lucky enough during my last visit to taste taiyaki which I really enjoyed! Unfortunately, I have never noticed these fruit stores but I have heard before that Japanese look for perfection in their fruit! Eating local food in a place where I visit is something I love to do when I visit various places in this world. The arigato food tours really awesome I think. The food pictures are so nice and its really really mouth watering!! 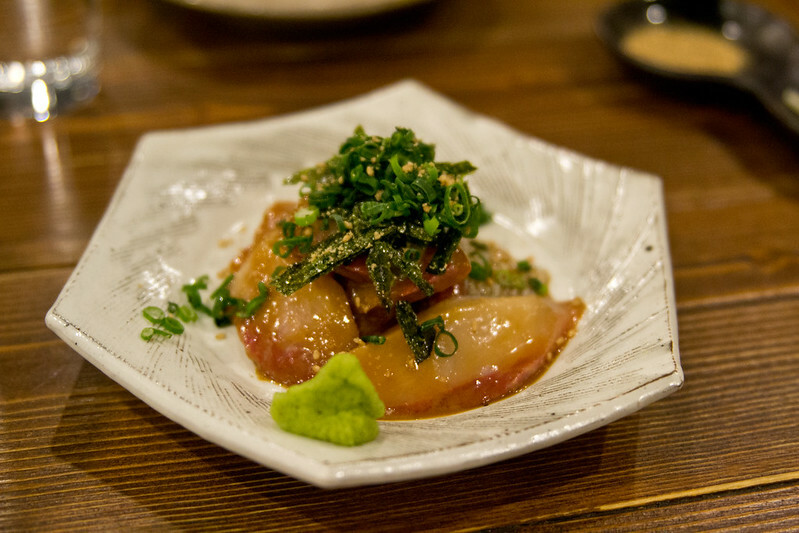 Tokyo seems to be a hub if good food and would love to try food tours next time , I visit!! There’s so much good food in Tokyo! Definitely nice to have some guidance from the tour.